Bell MTS Place is a busy place year-round, but there are times when things get downright muddy. This past weekend saw multiple diverse events that required quick changeups on the event level floor. First up was the Professional Bull Riders Show on Saturday, which required a complete transformation of Bell MTS Place from a hockey rink to a bull riding ring. The conversion saw the removal of the hockey boards and glass and the addition of an insulating cover and two layers of three-quarter-inch plywood to protect the ice. Then came the 30 truckloads of dirt and fencing, and 12 hours later the dirt floor was built. The next day, the PJ Masks show was in town. This required all the dirt to be removed – a four-and-a-half-hour process – along with the plywood sheets. PJ Masks required its own unique set-up, with a stage, curtains, and lighting. Thanks to a top-notch cleaning and ventilation system, there were no signs that livestock had ever been in the building. 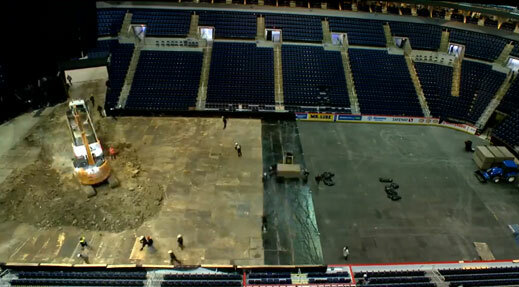 The PJ Masks show of course had to be taken down the next day, along with all of the flooring, to make way for the ice surface once again. With so much action above the ice, it’s not as easy as simply uncovering it. The ice crew has to put in time cleaning, flooding, and getting the rink back up to NHL standards before it’s ready for the Jets and Moose to use again.